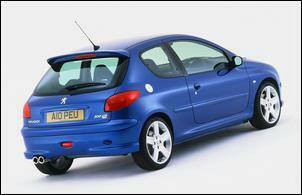 It was back in December 1999 that we last drove a Peugeot 206 - New Car Test - Peugeot 206 GTi. The little Pug was newly released and oh boy, did we love it! From its torquey engine to its delightful steering, from its long distance prowess to its handling grip, we thought it a helluva good small sporting car. In fact, all we could find as downers were pedals much too close together, vibration and noise from the engine and a little bit of handling spookiness on very high speed sweepers. So when the keys to a current model 206 GTi 180 were handed to us, we were alive with expectation and enthusiasm. The 180 has 27 per cent more power than that original car, a close-ratio gearbox, sports exhaust and revised suspension with 17-inch wheels. And all at a price only 11 per cent more than in 1999! So what’s wrong with the GTi 180? For some drivers, nothing. 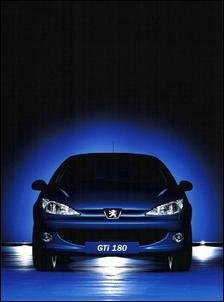 But for us the useability of the car has been so diminished that instead of the little Peugeot being a car capable of doing so much, the 180 has become a car of limited purpose. 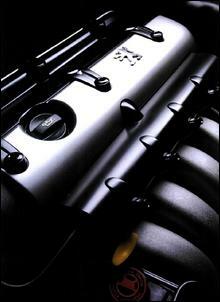 Let’s start off with the engine. While still using the 2-litre EW10J4S engine, power has risen from the current GTi’s 100kW at 6000 rpm to 130kW at 7000 rpm. There’s nothing much wrong with 130kW at seven grand – and a redline at 7300 - is there? But peak torque has gone from 190Nm at 4100 rpm to 202Nm at 4750. Even with the adjustable intake cam timing, peak torque at 4750 rpm is not going to allow the 206 “to be torqued along, working sedately and just sipping fuel”, something we said of the original. Sure, in a sporting small car you don’t want to do that all the time – but sometimes you do. In the 180 GTi you always need a heap of revs on board to get anywhere. Now if the engine was sewing-machine smooth that might be OK, but instead the 130kW engine is noisy and harsh, with a resonant boom from the exhaust adding to the unpleasantness. Did we say revs? You’d better believe it – the gearing of the 180 is incredibly short. In fact, at about 30 km/h per 1000 rpm in fifth (there's no sixth) we think it’s the lowest of any modern car that we’ve ever driven. On the freeway the engine’s spinning at something like 3500-4000 rpm in cruise: emphatically unlike the 1999 model, the GTi 180 isn’t a car in which you want to travel long distances. Not even something like a 50 kilometres each-way daily commute. The low, low gearing is needed because the extra engine power has come from some very traditional modification techniques. The cylinder head is machined, a dual-mode intake system upstream of the electronic throttle is fitted, and the exhaust features a 4-into-1 system with dual outlets and a low-restriction cat converter. It also feels as if the cams have undergone a major change – either in timing, or lift and duration characteristics. The idle is uneven and the engine can be a little hard to start; certainly a few revs are needed to climb steep driveways. Peugeot state that 80 per cent of peak torque is available from 2000 rpm but in the driving it never feels remotely like it. So with all this power – albeit with the loss in refinement and the need for ultra-low gearing – is the performance blistering? Not really. The claimed 0-100 is 7.4 seconds but we never got close to that, with our times at least a second (and often even more) slower. And the rolling on-road performance feels commensurate with a 0-100 time of about 9 seconds; unlike a turbo engine where the average power is high across the rev band, the 180’s is a top-end engine. Launch it correctly, go right to the redline before snatching the next gear and the 180’s not slow; but equally get caught in the wrong gear or short-change and there are countless cars that will gobble it for breakfast. Fuel economy is nothing outstanding; the quoted city cycle figure is 11.8 litres/100 km (a whopping 48 per cent worse than the standard GTi model!) and the highway cycle, 6.7 litres/100 km. We gained economy in the Tens. Ah, but what about the suspension – the ride and handling? While we’ve never thought Peugeot 4-cylinder engines (except the turbo-diesels) are anything cutting edge, we’ve always loved Pug ride and handling. And the 180 GTi, with stiffer springs, slightly different front-end alignment settings (including 5.5mm toe-out! ), upsized anti-roll bars and speed-sensitive power steering, handles very well. Anti-lock braking, stability and traction control systems are also all fitted – and don’t subtract from the handling enjoyment. 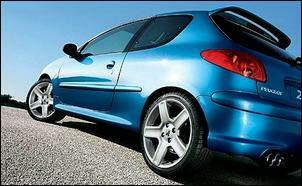 As with all Peugeots, the steering is simply superb. However, again we’d rather have the original – the 180 has a ride firmness which is extraordinary. Perhaps the nearest cars we can think of in terms of ride are the Lancer Evo 6.5 or the first series Impreza WRX STi – and both of those cars are vastly faster on the road. Even on a normally smooth freeway, the 180 has sharp vertical movement over every tiny bump; it’s uncomfortable and wearing – another reason why long drives aren’t much fun. However, it must be said that the suspension stiffness isn’t so great that the 180 hops around: the dampers continue to be very well matched to the springs and even on tough patched and broken bitumen, the 205/40 P7000 Pirellis hang on determinedly. Paradoxically, it’s not the handling and it’s not the performance which are the stand-outs. Instead, it’s the equipment level. For its price, the 206 GTi is extraordinarily well equipped with climate control and the previously mentioned ABS, traction control and stability control systems. But it’s also got rain-sensing windscreen wipers, six airbags, leather-and-Alcantara sports seats and a trip computer. The only shortcoming is an uncarpeted rear seat back - it's likely to get quickly scratched by cargo. However we doubt there’s a better equipped small car around for $34,990. If your idea of a ballistic small car is to get the cooking model and then fit bloody hard suspension, big wheels with low profile tyres, a big exhaust and new cams, we’re sure that you’ll see nothing wrong with the GTi 180. In fact, you’ll see a lot that is right – just look at that price! But on the other hand, if you want a cohesive car capable of fast point-to-point times but which can also enjoyably do the daily commute and all those other tasks that in reality make up 90 per cent of driving; engine flexibility that allows redlining or pottering; and handling which hangs on and hangs on but is combined with competent ride comfort – well then, the 180 GTi is not for you. 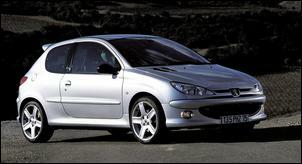 The Peugeot 206 GTi 180 was provided for this test by Peugeot Australia.